Although vegan sweet breads and cakes can be over-the-top sugary and just as unhealthy for you as the egg- and dairy-laced varieties, this delicious cake is a great way to enjoy tea time — and get an extra helping of veggies. Preheat the oven to 350 degrees. Lightly grease a 9-x-9-inch square cake pan with 1 tablespoon of the coconut oil and set aside. Combine the flours, baking soda, cinnamon, baking powder, and salt in a medium mixing bowl. Stir well to mix. Combine the flaxseeds and water in a small saucepan and bring to a simmer over medium heat while whisking. As soon as the mixture begins to thicken, about 1 minute, remove from heat and set aside. In a large mixing bowl, combine the brown rice syrup, sugar, vanilla extract, and remaining coconut oil. Whisk well to combine. Add the flaxseed mixture and stir well. Add the zucchini, carrot, and crushed pineapple and stir well to combine. Pulverize the pumpkin seeds in a blender, food processor, or spice grinder for 5 seconds. Add to the wet pineapple mixture and stir. Add the wet mixture to the flour and stir well until smooth, making sure there are no lumps. 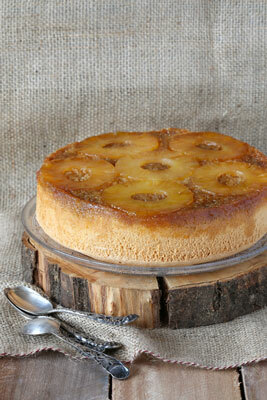 Smooth the batter into the pan, top with 5 or 6 pineapple rings, and bake for 50 minutes. Remove from the oven, drizzle on the maple syrup, and return the cake to the oven. Bake for another 5 minutes. Allow the cake to cool for at least 20 minutes before slicing. Per serving: Calories 465 (207 from Fat); Fat 23g (Saturated 17g); Cholesterol 0mg; Sodium 355mg; Carbohydrate 64g (Dietary Fiber 3g); Protein 5g.